Those days are history when you have to spend hundreds of bucks for the sake of making an international call. Even for the national calls, they can make free calls now, without spending even a single penny from their pockets. If you have a strong internet connection and a host device to make a call, you are good to go. Now, you can get the chance to call directly from your Mac, PC or even smartphone. Even when you are calling from your phone, you just have to pay for the internet connection, which is actually a part and parcel of your daily use. Why text when you can call directly without spending a single buck? Just learn more on how to work on that. Right now, making free calls is rather easy and you don’t have to worry about the quality of it. 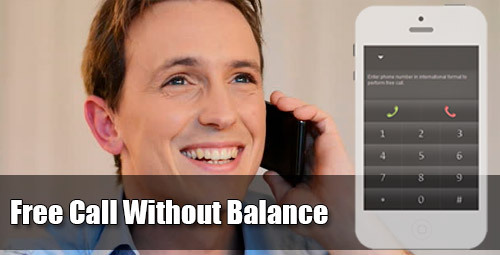 Through a simple online source, you are about to make free call without balance and get to use it anytime you want. You get the opportunity to talk with anyone you want and anywhere in the world. Generally, ISD calls are rather expensive and it takes a chunk of your money within minutes. Now you don’t have to worry about that when you have the right help to consider through free calling services. Using just a simple web browser, now you can make a call anywhere globally. The reliable software is able to deliver this possibility with great quality conversations with anyone you like. You just need a web browser and this free calling app. You are even free from using any additional plugins while working on free call session. Moreover, you don’t have to provide any credit card details too. When you are free from trials and credit card information, you don’t have to fear about your personal information being leaked. Sometimes, the sluggish designs of some apps make it rather difficult to understand the working ability and end up losing some clients. The reliable app offering free call without balance will not provide any of these services and you will know why. The design is rather straightforward and the dialing pad is designed just like your smartphone. Just as your phone has a green button and red button, the online design will have that too. So, once you have dialed a number, click on the green button. Similarly, end your call by pressing the red button on your screen. Now, it is rather easy to make any international call when you have IEvaphone by your side. You can log online and click on the official website to make free call without balance. After that, you can dial the number and wait for establishing the connection. There is no need to work on extra plug-in, making it easier to avoid any messy wired connectivity. As you can open this app in your smartphone, so you can make a call even when on the move.